String Planet plays Songs from the Home Planet. Classical chops and inventive composing meet an exotic and eclectic pop groove. "World music from another world" - fun, loose, vibrant, beautiful and ever-so-slightly twisted. Total playing time is approx. 47 minutes. String Planet is Novi Novog, Viola, and Larry Tuttle, The Stick. Novi Novog and her viola have been heard and seen on recordings, films and concert stages all over the world. She is a top session musician, with a long list of credits including solos on Prince's "Purple Rain" and "Raspberry Beret," The Doobie Brothers' "Black Water", and album appearances for such diverse artists as Bonnie Raitt, Terrance Trent D'Arby, Michael Jackson, and many others. A valley girl from North Hollywood, CA, Novi began playing piano at age four. When she was eight, she took up the violin, then moved on to viola. 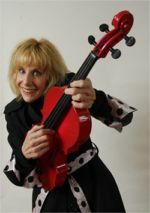 As part of the American Youth Symphony, Novi studied under Mehli Mehta, then attended California Institute of the Arts on scholarship under Louis Kievman, where she received the American String Teachers Award. In addition to her work in viola and piano, she studied composition at Cal Arts under Leonard Stein and Alan Chaplin. Larry Tuttle and The Stick were on a collision course from the very start. It was a perfect fit. 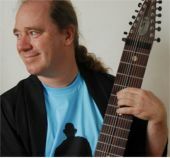 Growing up in Seattle, Washington, Larry Tuttle discovered the string bass at age nine and embarked on a childhood saturated in music. Larry studied classically at the University of Washington as a string bass major under James Harnett (principal bass - Seattle Symphony) as well as taking extensive private study with such notables as Ron Simon, Ring Warner and Oscar Zimmerman. Click the button below to add the Songs from the Home Planet to your wish list.